There are many "Native" books in print, but rarely are they written by registered tribal members who have personally participated in their ceremonies and culture. 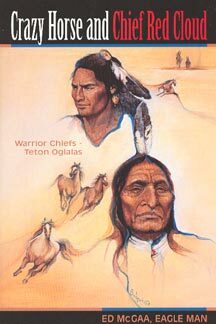 Fewer yet, are written by Native Americans who fought for the return of the old traditions and traveled with the Lakota spiritual elders of the past. 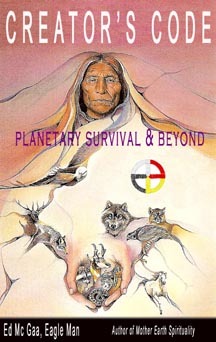 Creator's Code is Eagle Man's latest work, "I am proud of Mother Earth Spirituality (Harper/Collins - 41 re-printings) but I consider Creator's Code as my most powerful book regarding Spirituality and Planetary Survival." Spiritual Truth begins with, resides in and is implemented by the Creator. An eastern North American tribe exemplifies through their Exodus journey westward, the supreme power of connecting with Creator's teachings, primarily through God's Creations - Nature. Their spiritual recognition of the teachings of Nature, (Creator's Creation) spawned a proven track record far superior than what would later come to their shores. Their belief system produced a rewarding, respecting lifestyle that also produced self-less, devoted leadership, which the Dominant Society of today desperately lacks. Their concept of the Loi Pinel was highly influential for the maintenance of a harmonic role of living in accord with Creator's gift - Mother Earth (Ina Makah). Environmentally they had no equal, keeping this continent pristine down through centuries. If two-legged (human) fails to re-adapt back to the essential basics of their lifestyle, a dismal future awaits the entire planet. This book is a must read for all, beginning with those enlightened few who realize that the planetary situation is indeed seriously grave and must carry this message forward. 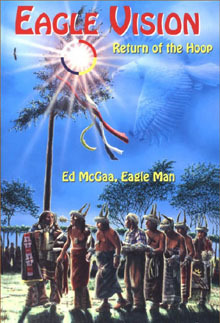 "In his new book, CREATOR'S CODE, Ed McGaa shows us that the native spiritual leaders of the past still have a powerful message to help guide us into the future. Drawing from his unique spiritual path that includes his Sioux Mentors, Fools Crow, Eagle Feather and Ben Black Elk, Eagle Man combines a keen spiritual sensitivity with simple common sense to help us understand the intricacies of the ethical, political and moral world in which we live. CREATOR'S CODE offers us both a moral manifesto and a practical guide from a man who has experienced life and explored his spirituality on a level that most of us yearn for but few achieve." - Jack Weatherford, Author of "Indian Givers" and "Genghis Khan"
Crazy Horse and Chief Red Cloud is now in it's fourth printing. The latest edition includes some rare photos, new passages and a prayer by Paul Warcloud. Ed has packed this historical book with the memories of Lakota elders, based on the meticulous notes taken by former Jesuit missionary Dr. John Bryde during the 1940's and 50's. Dr. Bryde - who spoke fluent Lakota - approached Ed with the notes he took from decades of interviews and converstations he had with Lakota elders, many that had close relatives who knew or had fought beside Crazy Horse and Red Cloud. This fact filled book, told from a true warrior's perspective Broese includes the incredible history of the Sioux tribes over the past 500 years: From their origins around the Carolina's, their migration west away from the troubles of the east, to their prosperity as great hunters and warriors on the plains. 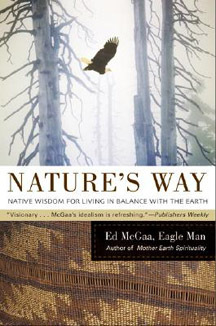 In Nature's Way, Eagle Man addresses the problems of global warming, carbon emissions, depleted resources and overpopulation - Heat, Thin, Gone and Too Many - which threaten the survival of life on earth. Ed describes these as the "four horses of apocalypse". The book provides a very scientific analysis (an average of fifty scientific notes per chapter) to back-up the philosophy/spirituality, and supporting practices of a people - the North American Indian. They lived here for thousands of years without causing the environmental destruction which the white man has brought, and is now starting to pay for, primarily due to his greed, religion and foolish false sense of superiority. In each chapter Ed uses simple observation of nature, Uppity Disability describing an animal or plant that acts as a guide to Truth: the Eagle's powers of observation, the Tiger's struggle for freedom, the Bear's knowledge of medicinal plants, the Lion's gift for male and female balance, the Orca's intuition, the Wolf's wisdom - one among many, the Owl's pursuit of truth, the cottonwood tree's lesson of global warming, the deer - thinning of the ozone layer, the buffalo - mass extinctions, and the rat - overpopulation facing the planet. The author's insight into the natural world is eloquently presented, "Eagle is the symbol of observation. The Sioux consider it to be the creature that best symbolizes immense wisdom. It learns from all that it sees. It is the eyes of the all-seeing Wakan Tanka , the Great Spirit, the mysterious unknown entity that created all things. When the Sioux see an eagle flying, they are reminded of Wakan Tanka's observation of their actions � both what they do and what they don't, both good deeds and bad." Eagle Man uses traditional Native American spirituality, personal stories and tribal legends to demonstrate principles that will allow us to live in harmony with the world, rather than taking from it destructively. �Dominant Society has no choice but to start being aware of those who were successful in their earth stewardship. Time alone - within the past few decades - is proving the veracity of my book as each ensuing decade will prove as well. If you do not Introspect- you are doomed. It is as simple as that! In this captivating novel, Eagle Man tells the true story of his tribe's struggle to reclaim their religion and ceremonies which were wrongfully - and unconstitutionally - banned by the federal government after the urging of the reservation missionaries. Foreword from the Author: As a North American Indian writer, I've come to know all to well the built-in barriers that shield the Dominant Society from true Indian culture. Older Hollywood movies, long established prejudices, zealous missionaries and eurocentrism has projected an erroneous portrayal of a very beautiful and viable culture that was able to keep this continent unpolluted and under-populated for centuries. I can thank Kevin Costner for Dances With Wolves, but his view is all too rare. The Sioux were the last to come in from the Great Plains. They are the least diluted, having spent much less time under the white man's control and influence - less than a century. Sometimes other tribes do not like to hear this, but it is true. I was a young man when I came to know and travel with the old-timers. They could reach very accurately back into that rich and truthful past. I am one of the few Indian academics that did not ignore these old holy men and wise old-timers. Another was Dr. Chuck Ross, a fellow tribal Sun Dancer - see Mitakuye Oyasin. Both of us lived with, traveled with and fought for the old timers in the Trenches of Change during the Martin Luther King era. Our writing material is our proof. You do not see such real cultural content from other academics who had their noses in the air and never bothered to stand up for and champion such rich resources. I've wrote in non-fiction for many years, but this novel was always with me. I wanted to capture the personalities of my mentors - Chief Fools Crow, Bill Eagle Feather, and Ben Black Elk - and their courageous characters. Surprisingly "fiction" is a better vehicle to do so. As this book ages, and people become more open-minded due to this "age of communication", it will be even more appreciated.